Introduction: Gena Philibert-Ortega is a genealogist and author of the book “From the Family Kitchen.” In this guest blog post—in celebration of today being Veterans Day—Gena searches old newspapers to help fill in the story of an ancestor’s military service during World War I. As our thoughts on this Veterans Day turn to the nation’s military personnel, you may be thinking about one of your ancestors who was a veteran—and wondering how you could find out more about him or her. Quick question: if you are researching a soldier where should you search? Your most immediate answer might include searching a familiar genealogy subscription website or ordering military and pension records. While those are important places to start, have you considered searching old newspapers? Hometown newspapers provide information about young men and women who have gone off to war. In some cases these mentions of people can be numerous. Search for these old newspaper articles to add to the official military records you have already gathered to help tell your ancestor’s story. As an example, let’s look at the military life of Sgt. Ernest L. Clayton from Blackwells, Georgia. Sgt. Clayton was a World War I soldier serving in France. His WWI draft registration card from 1 June 1917 indicates that he was a college student prior to his service. Fast forward to April 1918 and we see from the local news section of the Cobb County Times that Sgt. Ernest Clayton, from Camp Gordon, spent his Sunday in town with his friends. Camp Gordon, now known as Fort Gordon, is in Augusta, Georgia, and was established in 1917. 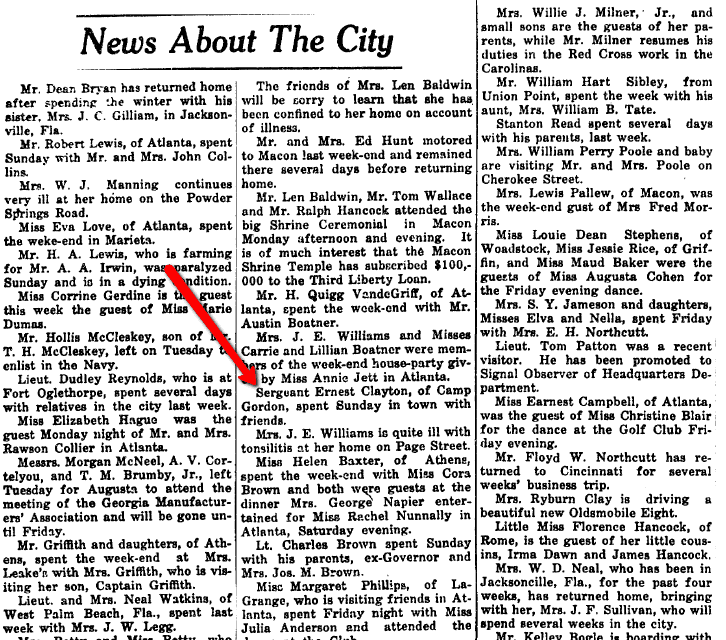 It’s important to remember that many times these smaller city newspapers did contain short mentions of the comings and goings of community members. In those hometown newspapers you can find details of the soldier and his or her family. Think of older newspapers as the Facebook of their time. Just as we would now share important news of our family through Facebook posts, our ancestors shared their highlights with the local newspaper. It wasn’t too long ago that newspapers even printed the letters that families received from their military-serving family members. The following article is a letter from Sgt. Clayton to his sister, and has a photo of him in uniform. As an introduction to the letter, the newspaper editor let the community know that Clayton was a part of Battery B, 320th Field Artillery, and that he fought in the Battle of Saint Mihiel on 12-15 September 1918. This introduction indicated that he was already in the military when he filled out his draft registration, having entered in May 1917. There’s no doubt that having a soldier fighting in a war could be nerve wracking for family members on the home front. Not knowing how their son or daughter was doing, especially in a time when communication methods were limited, was an enormous stress. Receiving erroneous news must have been even more difficult to recover from. World War I on the Western Front ended on 11 November 1918 with the signing of the armistice in France between the allies and Germany. That day was originally commemorated as Armistice Day (it became known as Veterans Day in the U.S. after World War II). That fateful day took on special meaning for the Clayton family after Sgt. Clayton was unofficially listed as killed in action during the last days of the war. To the family’s great relief, that news of his death turned out to be erroneous! 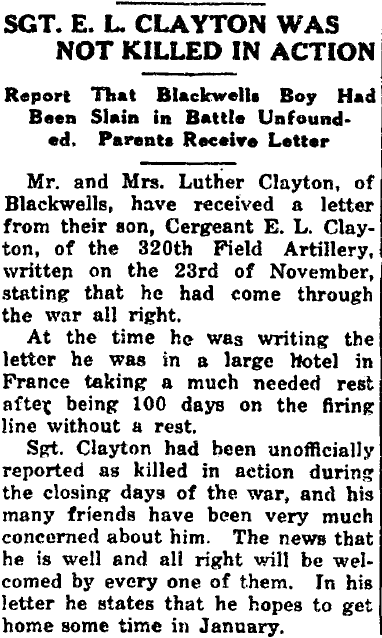 They received a letter (which the family shared with the local newspaper) that Clayton wrote them on 23 November 1918—after the war had ended, and after he was supposedly dead. He wrote the letter from a hotel room in France, where he was enjoying some rest after 100 days on the firing line. He wrote that he anticipated arriving back home from the war in January 1919. This Veterans Day, spend some time looking for your veteran ancestor in old newspapers. Remember that military service information can be found in more than just the official government military records! You can often find much more information about your veteran ancestor in letters, photos, draft lists, pension lists and other types of articles published in old newspapers. Genealogy Tip: Make sure to search various versions of a person’s name when using a search engine. In searching for Sgt. Clayton, I searched on just the surname Clayton, as well as E. L. Clayton, Ernest Clayton, and other variations. I also searched for the names of his parents and sister.